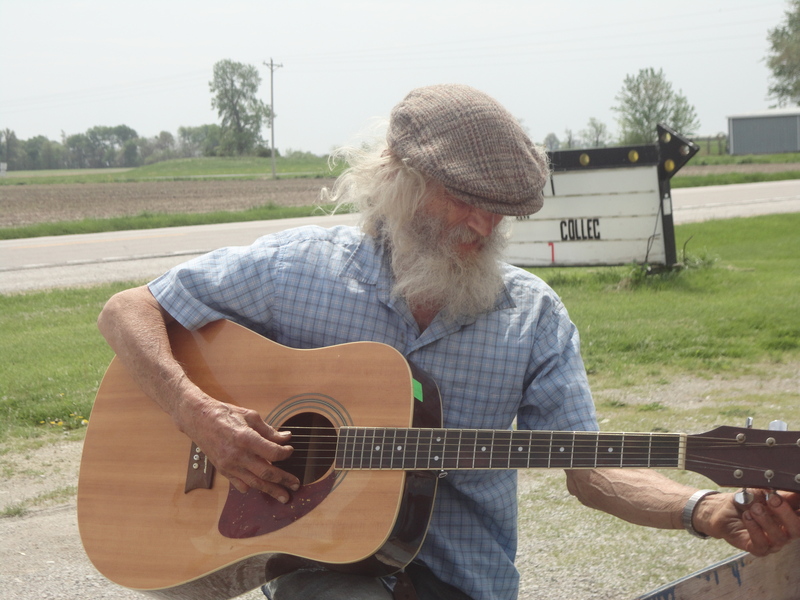 I met up with Backwoods “Hobo” Jack at the Wayside Antique Mall, a neat stop just south of Donnellson, Illinois where he was kind enough to allow me to interview him for my column in Farm World. Backwoods Jack is what Jack Sophir calls himself, since he lived in the middle of nowhere. He said that the moniker of “Hobo” came from Mike Wolfe on the American Pickers. Backwoods Hobo Jack has been on two American Picker episodes and has become quite the celebrity although I don’t really think he sees himself that way. “You can’t save it, can’t keep it all so I share it with others,” he said. Jack sells his items at the antique mall and sets up at swap meets about three times a year. Traveling around the country for 15 years, in 1975 Backwoods Jack bought property in rural Litchfield, Illinois and set down roots. Setting up over a dozen buildings to house his treasures, Jack lives in a cabin with his dogs and said that this past winter almost got the best of him. One interesting aspect he shared about buying antiques these days is that with the downturn in the economy he said that investors are now buying them to have a place to keep their money, something that won’t lose its value. This has caused Backwoods Jack to start pulling from his old stash, fix up items and sell them. Listening to his songs on his CD’s, I enjoy his poetry and music, in fact, I admit, I am a bit jealous of Backwards “Hobo” Jack. From the time I was a kid, I always dreamed of the freedom of the road and thought I would like to jump a train car and see the world not knowing just where I was headed. Unlike Jack, I never had the courage to just head out, perhaps that is why I love being a travel writer these days, it gives me a chance to live out the travel fever that consumes me, I don’t think there is anywhere I don’t want to go, or anything I don’t want to see. The other dream he lived out that I thought (before I got old and cranky and loved the luxury of heat and convenience) was to live in the middle of nowhere and write. I pictured myself in a cabin in the middle of Colorado typing away the next great American novel. I guess sitting in my farm house kitchen writing my travel blog is just a different form of the dream. Lucky girl that I am!